In 2007, Michigan decided that the Lloyd Carr era was over. The only problem was that the storied program didn’t have anyone locked in to take the vacant position. Speculation was that LSU’s head coach Les Miles would return to Ann Arbor, where he played and coached, but Miles made an announcement before he led his LSU Tigers into that year’s SEC Championship game. Michigan then turned to Rich Rodriguez, despite not being the program’s top choice to fill the vacancy, and despite the fact that Rodriguez’ coaching style was in stark contrast to the Wolverine’s 4-3 defense and pro style offense. It was not a pleasant three years for Rodriguez or Michigan football. In his brief tenure at Michigan, Rodriguez was 15-22 with just six wins against Big Ten opponents. Michigan athletic director Dave Brandon showed that the program didn’t necessarily learn their lesson, firing Rodriguez in favor of what he thought would be Jim Harbaugh, who led the Stanford Cardinal to a 12-1 record and an Orange Bowl victory. Harbaugh instead opted to take the head coaching job for the NFL’s San Francisco 49ers. Brandon quickly turned his focus once again to Miles. But, once again, Miles said thanks, but no thanks. Brandon is hoping the third time is a charm, and Michigan announced today the hiring of San Diego State head coach Brady Hoke. 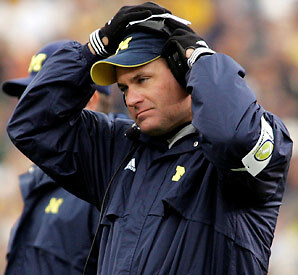 Brandon insists that Hoke was Michigan’s first option, but the timing of his hiring suggests otherwise. Hoke’s season with SDSU wrapped up on December 23rd, when he coached his Aztecs to a bowl victory over Navy. And yet the decision to hire him did not take place until after Harbaugh and Miles were not only finished with their bowl games, but the decision also came after each coach publicly announced their decisions to coach somewhere other than Ann Arbor. On paper, Hoke actually looks like a better fit for the traditional Michigan program–he did, after all, coach as an assistant at Michigan from 1995-2002. Hoke actually has an overall losing record (47-50), but he has shown an ability to revamp programs. He led Ball State to a 12-1 record in 2008, and after a losing season in his first year at SDSU, Hoke led the Aztecs to a 9-4 mark. He will have his work cut out for him as the head man in Ann Arbor though. Not only will all eyes be on him to see if he can right the ship, the new head coach will also have to revamp, recruit and reconstruct Michigan’s defense, which ranked 110th in the FBS. He will also have to give the Wolverine offense its second complete overhaul in four years if he goes with a more traditional offense that the Wolverines have been known for in the last few decades, instead of Rodriguez’ spread attack. Add the fact that Hoke is taking over a programs with only three weeks before National Signing Day, and it could be at least two years before fans of the Big Blue can expect any reason to celebrate. Brandon will go down as a genious or a moron when the dust settles, and nothing in between. If he can’t dig the program out, Brandon will be looking for a new job long before Hoke will. For the second consecutive week, College FootBlog rolls out our 3rd & 1 feature, which breaks down three observations from the college football action from the previous weekend. And we finish by giving one key match up to look for in the upcoming week. Let’s get to it, shall we? 1st: Another week, another set of hangover games. Last weekend, the Alabama Crimson Tide fell at South Carolina after thumping the hated Florida Gators the week before. This weekend, Kentucky returned the favor. Steve Spurrier took his Gamecocks into Lexington, and the Wildcats shocked them 31-28. Not to be outdone, Oregon State lost a double-overtime thriller to Washington, just one week after knocking off previously undefeated Arizona. 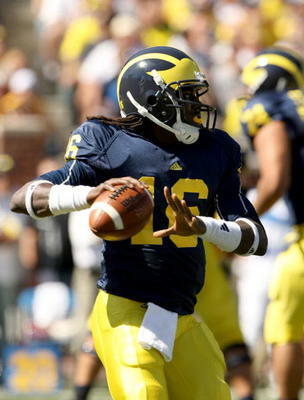 2nd: Michigan QB Denard Robinson cannot take the punishment of a full Big Ten schedule. Although Robinson is the most explosive player in college football, Rich Rodriguez has no other legitimate weapons on offense, making Robinson a one-man show. Robinson is on pace for around 250 rushes this year–if his body can take it. They need more production and more carries from their running backs to take some pressure off Robinson (RB Vincent Smith is second on the team in yards and carries and currently has nearly half the rushes (70) that Robinson has accumulated this season. More importantly, Robinson, who is listed 6’0″ and only 188 lbs. does not have the body to take that many hits in the thick of the Big Ten schedule. 3rd: John Clay is the real deal. The Big Ten’s reigning Offensive Player of the Year, along with Wisconsin’s massive offensive line smacked Ohio State right in the mouth this weekend, en route to this season’s biggest upset as they took dominated the Buckeyes 31-18. Clay led the Badgers’ ground assault with 104 yards and two touchdowns on just 21 carries (5.0 yards per carry). Behind arguably the most physical offensive line in the country, the 255 lb. junior proved to be too much for a Ohio State defense that features seven players who could be playing in the NFL in the very near future. Clay and fellow tailback James White will get another opportunity to shine on national television this upcoming weekend when they travel to Iowa City to take on the Hawkeyes. If he has a similar performance against Iowa’s stout defense, Heisman voters will be forced to take notice. …and 1: Mizzou QB Blaine Gabbert will get his first major test of 2010 this weekend when Oklahoma comes to town. At 265 yards per game, Gabbert ranks 20th in the country. Statistically, the Sooners defense has been far from stellar this season, but a closer look shows that Bob Stoops’ squad has brought their A-Game in their only two legitimate contests so far this season. The Sooners shut down Florida State in week 2 and rattled Texas QB Garrett Gilbert in the Red River Rivalry game a couple of weeks ago. Look for OU to come after Gabbert, who has battled through a hip injury. The Sooners will bring it this upcoming weekend, and they will look to ruin Mizzou’s homecoming weekend on the national TV game of the week. Heading into the 2010 college football season at Ann Arbor, it wasn’t even clear who the starter at quarterback would be, so there was obviously no talk of Heisman. Oh, what a difference a few weeks can make. It’s very early in the season, but Denard Robinson has put himself and his team back on the map, and in the process, he may also be saving his head coach, Rich Rodriguez’ job. All Robinson has done to this point is lead the nation in total offense and beat hated Notre Dame in week 2. In this edition of College FootBlog, we examine three reasons for optimism for Michigan fans, and we also break down the three biggest hurdles standing in his way to making the trip to New York this December. 1. Opposing Defenses: With Ohio State, Iowa and Wisconsin left on the schedule, you would think this would be a negative. True, going against three of the best defenses in the country will provide a significant challenge, a closer look at the rest of Michigan’s opponents, and more notably, the defenses they will face, should have Robinson salivating. Of the final nine games of the regular season, the Wolverines will face only two (Ohio State and Iowa) that are currently ranked in the top 25 in total defense. And next week’s opponent, Bowling Green, is ranked 111th nationally in that category. 2. National Television: If Michigan can continue to win, they have a chance to play nationally televised games against Michigan State, Penn State, Iowa, Wisconsin and the showdown against the Buckeyes on November 27th. This could backfire if Robinson has a bad game or two, but with his explosiveness and knack for the big play, it could also play hugely in his favor. He has proven so far this season that the more opportunities he gets, the more big plays he produces. 3. Ohio State: With the defensive woes that Michigan has shown (most recently against FCS opponent UMass last weekend), there is very little chance that Michigan will be in the hunt for a Big Ten title this season, and by the time the Big Game against the hated Buckeyes rolls around, the Wolverines could have nothing to lose. This actually plays into Michigan and Robinson’s favor. Rich-Rod has been known for trick plays and gambling, but look for him to pull out all stops against OSU. If the game stays tight, even against one of the best defenses in the nation (OSU), Robinson has the speed and athleticism that is impossible to defend. This scenario could provide Robinson with a couple of opportunities for a signature Heisman moment if the Wolverines were to pull off the unthinkable and take down the Buckeyes at the Horseshoe in the final week of the regular season. 1. Ohio State: Just as this game could catapult Robinson to center stage of the Heisman race, this game could also be catastrophic. Since his arrival at OSU, Jim Tressel has owned the Wolverines, going 8-1 in this rivalry game. Of this success, there has been one constant–defense. Tressel has consistently produced top 10 defenses since coming to Columbus, and the 2010 version could be his best yet. Also, considering this game is at the Horseshoe, it could be a rough finale to the regular season for Robinson. 2. Michigan’s Final Record: Unless Michigan can find a dominant defense in the next two weeks, they will inevitably lose some games this season, and despite the 3-0 start, they have quite a task if they want to finish out the season with 7-8 wins. Although it is not a requirement that you win your conference to take home the Heisman, the numbers are telling. Six out of the last seven Heisman winners played on teams that won their respective conference. Robinson would likely have to “buck” that trend (no pun intended). 3. Robinson Must Stay Healthy: At 6’0″ and 188 lbs., Robinson is not the biggest, most physical QB in the Big Ten. His style of play and the number of carries as he gets into the thick of conference play in the Big Ten could prove to be a difficult task. If he can stay healthy and continue to get the number of carries he has managed to this point, the stats will be there. One big hit, however, could be the difference maker in whether or not he continues to light up the scoreboard like he has so far this season. With Spring Football officially in the books and summer workouts right around the corner, College FootBlog is taking a conference by conference look at the upcoming 2010 football season. In last week’s edition, we provided a breakdown and power ranking for each division of the ACC (see links for Atlantic and Coastal). In this week’s two-part article, we take a look at the Big Ten, giving insight and analysis from last season, what we learned from the spring and what the outlook will be for this fall. In Part I of the Big Ten breakdown, we rank the preseason #6-#11 teams, which will be immediately followed by our top five. 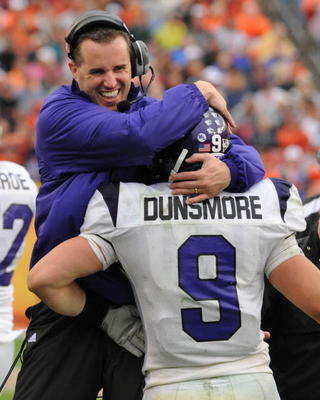 6: Northwestern: Pat Fitzgerald does more with little than any coach in the FBS. His Wildcats will once again be counted out by most pollsters, but don’t be surprised if they exceed expectations again in 2010 (even in our poll). NU loses seven wideouts from last year’s team and must also replace quarterback Mike Kafka. Filling the role of trigger man for the NU offense will be Dan Persa, who had a solid spring and has more running ability than Kafka. The defense should be decent, led by a couple of senior linebackers, Quentin Davie and Nate Williams. Regardless of depth and overall talent, Coach Fitzgerald will have his team playing hard and smart, and that should be enough to get them to another bowl game this fall. 7. Purdue: The Boilermakers should be an interesting team in 2010. This year, former Miami Hurricanes’ quarterback Robert Marve is eligible and will get his opportunity to be the starter. If they are going to keep this power ranking, they must improve on their defense against the run, which gave up more than 170 yards on the ground per game. The Boilermakers proved to Ohio State last year that they can play well in West Lafayette, and with visits from Minnesota, Michigan and Indiana, Purdue will have a great opportunity to finish above those programs at season’s end. 8. Michigan: Rich Rodriguez is going to be coaching for his job this fall. After a 4-0 start last season, the Wolverines dropped seven of their last eight games, and the defense was…well…not good, ranking 82nd nationally in a conference that did was not known last season for having explosive offenses. Tate Forcier is a very exciting player at QB, and Denard Robinson gives defenses a change of pace, but all the offense in the world will not be enough unless the defense improves dramatically this season. 9. Indiana: Quarterback Ben Chappell returns for his senior season and despite throwing for nearly 3,000 yards last season, he must improve his TD/Int ratio, which was 17/15 last fall. The Hoosiers travel to Ohio State and Wisconsin this year and play host to Iowa and Penn State. Barring a huge upset, they will be 0-4 in those games, and it will be all they can do to escape the cellar of the conference. IU ranked 88th in total defense last year, and unless something changes in a big way, they will have a similar defense this time around. 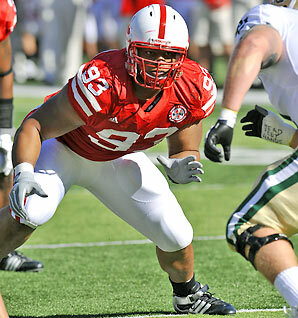 A bad defense and an offense that turns the ball over will make it difficult to stay above water in the Big Ten in 2010. 10: Minnesota: After a solid 2008 season, quarterback Adam Weber took a step backwards last season, throwing more picks (15) than he did touchdowns (13). The Gophers sported the Big Ten’s worst offense, and only managed 13 rushing touchdowns all season. They now have their third offensive coordinator in three years, which makes it hard to believe things will change for the better in 2010. Defensively, the entire front seven from last year’s middle-of-the-pack defense is gone. Final verdict–things are not looking good for the 2010 campaign in Minneapolis. 11. Illinois: The Ron Zook experiment will likely come to an end this season. Zook has always been an elite recruiter, but he has once again proven that he cannot put a championship football team together, despite having enough talent to compete with anyone in his conference. The departure of Arrelious Benn takes away the Illini’s only legitimate playmaker from last year’s team. Look for our Top 5 Preseason Teams from the Big Ten tomorrow! 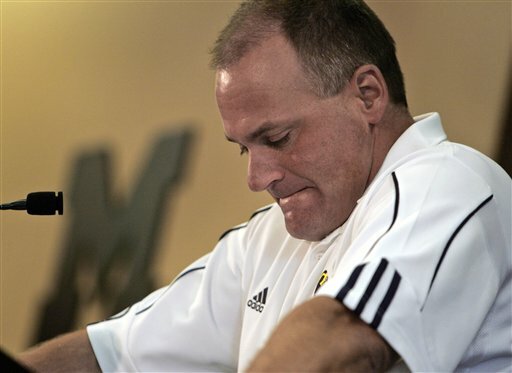 When it was first reported last fall that Michigan head football coach Rich Rodriguez was breaking NCAA rules which limit the number of hours student athletes can practice and take part in sports activities, many assumed he and the Michigan program might get a slap on the wrists, if any punishment at all. But with the recent discovery of the same types of violations at West Virginia during Rodriguez’ tenure there, it appears that the NCAA is on to something bigger. Once the NCAA sinks its teeth into you, they are bound to find something, and usually, it is not good for the coaches and university they investigate. In August of last year, former Michigan players and at least one current anonymous player came forward with the information that sparked the media reports and subsequent investigation. The players alleged that Rodriguez and his staff consistently exceeded the NCAA rule that limits weekly practice time to twenty hours, but possibly the most shocking, was one of the allegations from a former Michigan wideout, Toney Clemons, who claims that he had to put in multiple twelve-hour days on Sunday with all of the football-related activities. That’s a sweatshop that would make Kathie Lee proud. On February 22nd, 2010, the NCAA formally issued its notice of allegations, and that investigation is on-going. However, the excess practice time does not appear to be the center of their investigation, but rather, the quality control and training staffs and their involvement with off-season workouts, which were prohibited by NCAA guidelines. The NCAA also alleges that Michigan, specifically a grad assistant, misled them in their investigation, which effectively brought more torches to the witch hunt……which brings us to the NCAA’s findings at West Virginia. Unfortunately for Rodriguez, where there is smoke, there is usually fire. And while he and the Michigan program will likely face some kind of sanctions from the NCAA’s investigation, it is not likely to be overly harsh–keep in mind that the NCAA cannot hand Michigan a more stringent penalty because of something their head coach did before he even arrived in Ann Arbor. Apparently, the NCAA doesn’t exactly believe him. And they intend to prove it. Who’s on the Hot Seat in 2010? Even though it is only March, there is already some buzz around college football about head coaches at some prestigious programs who could be coaching for their jobs next fall. College FootBlog takes a look at five coaches that will have a lot of eyes on them during the 2010 season. 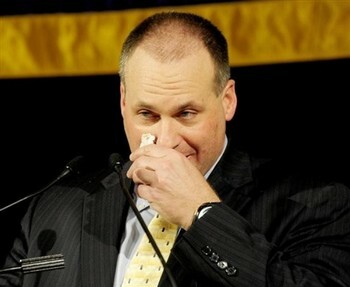 Unfortunately for Richt, the SEC, more than any other BCS conference, is a “what have you done for me lately?” league. 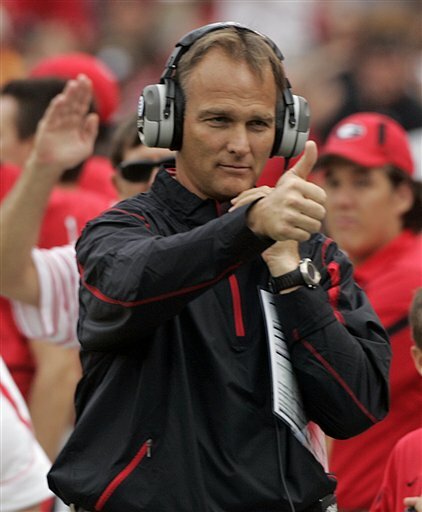 Despite a stellar record of 90-27, since taking over for the Bulldogs, to fans and boosters in Athens, Richt still has not been able to win the ‘big one,” and a repeat performance of last season’s 4-4 conference record could send him job hunting next January. Of all the coaches on this list, Richt makes the least sense, but ask Ohio State’s John Cooper if a great overall record is enough to keep a job at a bigtime college football program. “The Old Ball Coach” has made a very small splash since returning to the SEC five years ago. Long gone are the days of his “fun ‘n gun” offenses he had when he led the Florida Gators to their first National Championship. The Gamecocks expected big things from Spurrier, and although his overall record since taking the helm in Columbia, his SEC record is a very unimpressive 18-22 in his five-year tenure. He could be one more .500 season away from a forced retirement. Hawkins has faced criticism since his arrival at Boulder, and the rumblings from boosters and fans only intensified when he named his son, Cody as the starter at quarterback for the Buffs. Many thought last season would be his last at CU after his team produced a dismal record of 3-9. In Hawkins’ time there, he has managed a 16-33 record and a 10-22 record against Big 12 opponents. Like Hawkins, many were surprised that Zook still had a job this January. Zook brought his excellent recruiting skills with him to Champaign, but other than his first third full season there, his Illini teams have never finished better than 8th in the Big Ten. Take away his lone winning season in 2007, and Zook’s record is an absolute train wreck at 12-35. A slow start in 2010, and Zook could easily be replaced during the season this fall. After a good start in 2009 with a 4-0 record, including a thriller against rival Notre Dame, Rodriguez’ squad managed just one more win the rest of the season. The Wolverines lost back to back games by 25 points versus Penn State and Illinois, and many folks in Ann Arbor were calling for his head before Thanksgiving. Rodriguez has fallen victim to the same stubborn attitude that Bill Callahan brought to Nebraska. In Callahan’s case, he immediately instituted a West Coast offense with old school, smash-mouth option-style personnel. Rodriguez, on the other hand, immediately forced his spread option offense on a group of athletes who had come to Michigan because of Lloyd Carr’s pro-style attack. Callahan wore his welcome very quickly in Omaha. Rodriguez could easily follow suit. Let the Les Miles rumors begin! In Part 2 of our three-part coverage, College FootBlog continues our breakdown of the top six BCS conferences from the 2009 season. In case you missed it, we ranked the fifth and sixth conferences earlier this week (see link). We continue our analysis by providing a recap of last season and an outlook for next year for conferences #3 and #4 in our Power Rankings. If not for Texas making it to the BCS National Championship Game, the Big 12 would have ranked fifth or sixth in the ’09 Power Rankings. Nebraska came out of nowhere, but their offense was anemic. Oklahoma lost Sam Bradford and never really got on track all year. Add in Mizzou and Texas Tech not living up to high expectations coming off successful 2008 campaigns, and the Big 12 didn’t have much to talk about beyond Colt McCoy, Jordan Shipley and Ndamukong Suh. 2010 outlook: Next season will likely be more of the same for the Big 12. Although the loss of Colt McCoy in the first quarter of the BCS National Championship was a huge blow, it provided valuable experience to Freshman Garrett Gilbert. Oklahoma’s offense should be improved with Landry Jones having a year of experience under his belt, but their dominant defense will likely take a step back. The Sooners lose six defensive starters, including both corners and projected first-round DT Gerald McCoy. Texas Tech will likely take a year or two before they truly integrate to Tommy Tuberville’s system, Oklahoma State will have to replace starting quarterback Zac Robinson and will lose WR Dez Bryant to the NFL. Mizzou loses playmakers on each side of the ball in WR Denario Alexander and projected first round linebacker, Sean Weatherspoon. Add to that, Nebraska’s departure of Suh (who many project as the number one overall pick in April’s draft), and the Big 12 North will have trouble keeping points off the scoreboard. 2009 Recap: The major reason the Big Ten did not claim the #2 spot in the ’09 Power Rankings was depth. Iowa surprised many experts by effectively shutting Georgia Tech’s offense down, thanks in large part to All-Big Ten DE Adrian Clayborn, who is planning on returning for his senior year. Terrelle Pryor saved his best performance for last, as he dominated in Ohio State’s Rose Bowl win over Oregon. The Big Ten finished with a bowl record of 4-3, with a surprising win from Wisconsin over Miami and a Penn State victory over an offensively inept LSU team. A more in depth look at the top two teams from the conference, however, shows a couple of teams that were far from juggernauts. Iowa had one of the best defenses in the nation, but their offense was nothing to write home about. The Hawkeyes struggled to beat Arkansas State at home and had to depend on two blocked field goals at the end of the game to defeat another FCS opponent, Northern Iowa 17-16 in Iowa City. The Buckeyes nearly lost their opener to Navy at home and fell to a struggling USC team, and they later fell to 5-7 Purdue. Look for the Big Ten to make a serious run at the #2 conference in the country next season. Jim Tressel continues to put great defenses on the field for the Bucks and the offense should take a huge step forward with the return of running backs Brandon Saine and Boom Herron. And if Terrelle Pryor’s Rose Bowl performance was a sign of things to come, the Bucks will be the real deal come fall. Iowa is also very young on offense–the ‘Hawks will return both freshman running backs, quarterback Ricky Stanzi and wideout Marvin McNutt, who exploded onto the scene in 2009. Couple that with Adrian Clayborn and several returners on an already dominant defense, and the ‘Hawks could make a serious run in 2010. Three other teams from the Big Ten to keep an eye on next year are Northwestern, Wisconsin and Michigan. Northwestern head coach Pat Fitzgerald is one of the most underrated coaches in the country. Wisconsin’s John Clay took full advantage of being the work horse last year, and expect more of the same in 2010, and watch out for the Wolverines. This will be Rich Rodriguez’ third full season in Ann Arbor, and Tate Forcier will have a spring to put some much needed weight on. If UM can assemble an average defense, the Big Blue will be bowling again at year’s end.